So, we bought a parrot cage on eBay last week for about $24 and a little over $100 to ship (and btw the Buy It Now listing didn’t note the exorbitant shipping cost, so it was a little bit of a bait and switcheroo), so that we can finally bring the rest of our family, the parrots, out here. 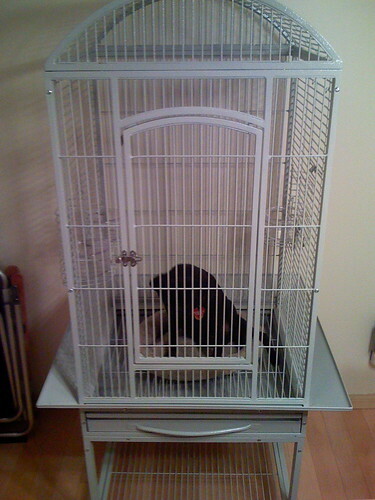 Honestly, even with the shipping the price was right, as these cages normally run several hundred dollars and shipping the parrots’ current cage out here separately from a big moving company move would cost probably around $200 and take forever. So, I assembled the beast of a cage the other night and couldn’t resist popping Thatcher in (atop her bed) for a quick picture. She wasn’t very pleased. I don’t know if you can tell due to the poor lighting, but she is decidedly frowning with her ears pointed down in a sulk. Don’t worry; she was only incarcerated for about 2 minutes before Kristin rescued her. This entry was posted in Parrot, Personal, Pug. Bookmark the permalink. Despite all my rage I am still just a pug in a cage!